In large nonstick skillet, melt 1 tablespoon butter over medium heat. Add green onions and jalapeno, and cook 3 minutes. In large bowl, whisk eggs, milk, and cumin. Pour egg mixture into skillet and gently stir 3 minutes or until eggs are cooked through. Remove from heat and season with salt, and pepper. Melt remaining 1 tablespoon butter on griddle over medium heat. Place 2 tortillas on griddle and top each with 1/4 cup cheese, 1/2 the egg mixture, another 1/4 cup cheese and a second tortilla. 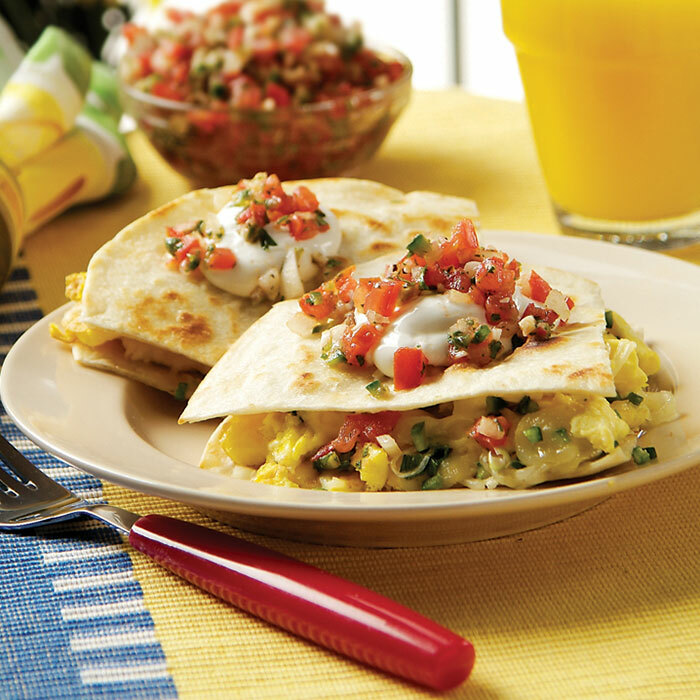 Cook 4 to 6 minutes or until tortillas are golden and cheese melts, turning quesadillas halfway through cooking. Cut each into quarters and serve topped with salsa, and sour cream.